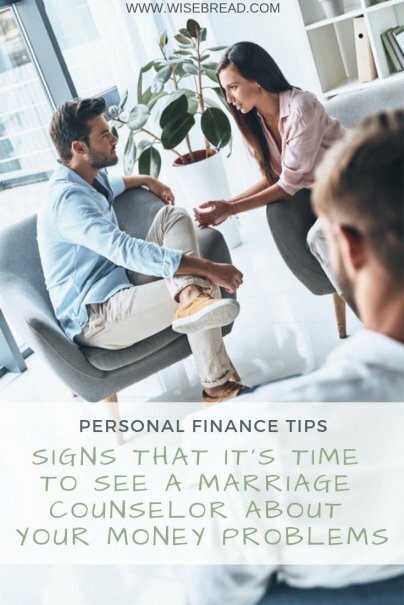 Home » Personal Finance » Debt Management » Is It Time to See a Marriage Counselor About Your Money Problems? Can't stop bickering about money with your spouse? You're not alone. According to a 2016 study by Ameriprise, about three in 10 couples disagree on finances at least once a month, mostly about major purchases or spending habits. Even though your partner might not cheat on you with another individual, financial infidelity can cause just as much pain and mistrust. Financial infidelity is when one partner makes significant money decisions without consulting the other. If one spouse has taken out a secret credit card, opened up a secret bank account, hides purchases or statements, or if cash goes missing, then these are all red flags. That same Ameriprise study also found that the couples who fight over money admit to having other underlying issues. Perhaps one spouse is too uptight about the budget or goes off the handle for overspending or debt. Maybe one spouse feels too restricted and spends freely because they feel they have the right to do so. Addictions to gambling, shopping, drugs, or alcohol are serious issues and can also be major budget killers. If one spouse is fighting an addiction that impacts the finances, then it's best to come to an agreement on how to protect your shared money. This might mean that the spouse battling addiction is taken off all financial accounts until they have sought out treatment and therapy. Not only does the partner with the addiction need to seek out individual therapy, but a few sessions with a marital counselor can help mend broken communication and hurt feelings that resulted from the addiction. With the help of a marriage counselor, you can determine how to help your spouse on their journey to recovery. Does your spouse have full control of the finances and won't let you have access to bank accounts or credit cards? Do you have to ask for an allowance or get permission to get a job in order to pay for your basic needs? There could be an issue with financial abuse, and if your spouse is willing to see a counselor, then let that be your first step. Perhaps your spouse is not fully aware that they are committing financial abuse, or that as a married couple, you have rights to all shared income.